Two things I know about the state of firearms in America: 1911s chambered in 9mm are currently very popular; and lots of people like owning unusual guns, something no one else at the range has. Rock Island Armory checks off both those boxes with its 9mm/.22 TCM combo packs. I know many of you just read that sentence and have no idea what I'm talking about. Let me explain. If you haven't heard of Rock Island Armory, it is a division of Arms Corporation of the Philippines (Armscor) and one of the biggest arms and ammo producers in Asia. If you own two or more 1911s, chances are Armscor made one of them, even though its name might not appear anywhere on it. While the company started out making GI-clone basic 1911s, it now has a full line of pistols loaded with all the modern controlsâ€”beavertails, extended safeties and so forthâ€”American 1911 fans have come to expect. Rock Island Armory does not build beautiful but temperamental works of art; it builds workhorses with common sense controls and businesslike finishes. All Rock Island Armory frames and slides are manufactured on modern CNC equipment out of 4140 chrome-moly steel. For several years now, the company has been offering combo packages: a 1911 supplied with two barrels and recoil springs. One of the barrels is chambered for 9mm, the other for Rock Island's proprietary bottleneck cartridge, the .22 TCM. This round flings a 40-grain .22 bullet out of the muzzle in excess of 2,000 fps. More on that a little bit later. For evaluation I secured the TCM Rock Ultra FS Combo. The combo consists of an all-steel, five-inch 1911, two barrels and two recoil springsâ€”all for a suggested retail of $806. The .22 TCM barrel is installed at the factory. The Rock Ultra FS features all the typical 1911 controls, along with an LPA adjustable rear sight and good-looking, aggressive G10 grip panels. This gun has a simple Parkerized finish. The front sight is a steel post with an orange fiber-optic insert. The rear sight is an LPA MPS1 all-steel fully adjustable model with two white dots. The left side of the slide features a small silver Rock Island Armory logo at the rear, and the right side of the slide features a subdued "TCM" forward of the ejection port. This pistol was manufactured in the Philippines, and that is marked on the underside of the dust cover. The pistol has an extended beavertail on an Ed Brown frame cut, extended bilateral safety, aggressively textured G10 grips and a steel magazine well. 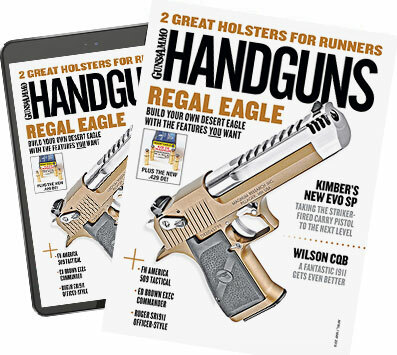 Both the magazine release and slide release are checkered. The clicks on the thumb safety were loud and positive, which I like. The mainspring housing is aluminum and checkered. The frontstrap of the frame features vertical serrations. Unloaded weight is 40 ounces. This is a Series 70-style pistol, which means no internal firing pin safety and hence a crisper, lighter trigger pull. Advertised trigger pull on this model is between four and six pounds, and the pull on my sample came in at just a shade over five pounds. The pistol ships with two 10-round stainless steel magazines, which work with both 9mm and .22 TCM cartridges. The slide fit on my sample was good. The barrel fit of both the 9mm and .22 TCM barrels was tight, and both barrels are ramped to support the high-pressure (compared to a .45 ACP) cartridges. To convert the .22 TCM to 9mm, simply swap out the barrels and recoil springs. There is a slight visual difference between the two recoil springs: The TCM spring is slightly shorter and of a thinner gauge. The recoil spring provided for the TCM is seven pounds, the one for the 9mm is 14 pounds. If you get confused as to which spring is which, trying both in the gun reveals a definite difference in resistance. The front of the .22 TCM barrel is flared to mate with the barrel bushing, and for most of its length it is a slender .50 inch in diameter. From the muzzle it looks like most .22 LR conversion barrels. The pistol has a full-length stainless steel recoil spring guide rod. Armscor has been working to increase its market presence in America. To that end, about five years ago it began manufacturing ammunition in Montana. I obtained Armscor 9mm ammunition as well as .22 TCM. Right now, Armscor is the only company making .22 TCM ammunition that I'm aware of, although several companies, including Hornady, make reloading dies for the cartridge. The .22 TCM cartridge was originally the brainchild of custom gunsmith Fred Craig. The .22 Micro-Mag, as Craig called it, was developed for several reasons. First, he wanted to design an American cartridge that could offer excellent muzzle energy and light recoilâ€”one compatible with, as he says, "the one true American pistol platform," the 1911. Second, he had economics in mind. Craig thinks it's only a matter of time before .45 ACP ammo costs $1 or more per round, and anything he could do to reduce the cost of ammunition would be a good thing. How did the .22 Micro-Mag end up the .22 TCM? Craig had been working for several years as a consultant to Armscor, helping to tweak its 1911s. He also hired and trained many of the machinists working at the Armscor factory in the Philippines. Craig had been working on a custom 1911 chambered in his .22 Micro Mag, using Rock Island Armory frames and slides, and the cartridge attracted the attention of Martin Tuason, president of Armscor. Tuason was excited about the cartridge, and it wasn't long before Rock Island Armory was making production versions of the pistol chambered in .22 TCMâ€”Tuason Craig Micro-Magnum. I have seen several articles in which the .22 TCM is described as a necked-down 9mm case. I think many of these reviewers were just assuming the 9mm was the starting point because the case head diameters are similar. But they're wrong: The parent case for the cartridge is the .223 Remington. The .22 TCM is a bottlenecked cartridge, and the shoulder starts about where the case of a 9mm ends. As the TCM is designed to fit and feed from standard 1911 magazines, the overall length will never be more than that of the .45 ACP: 1.275 inches. The .22 TCM is not the world's first bottlenecked cartridge fired out of a pistol, not by a long shot. You can go all the way back to the 7.63mm Mauser and 7.65mm Lugerâ€”both developed in the late 19th centuryâ€”not to mention the .357 SIG. Both HK and FN have developed minor caliber bottlenecked pistol cartridges in the last few decades: the 4.6x30mm and 5.7x28mm, respectively. FN's 5.7x28mm is the closest to the .22 TCM in ballistics, so let's compare the two. With the 5.7mm, FN designers were looking to create a light-recoiling cartridge to replace the 9mm that would also defeat personal body armor. It features bullets between 31 and 40 grains, with velocities up to 2,300 fpsâ€”at least when fired out of the firm's P90 bullpup, which sports a 10.4-inch barrel. The original 5.7mm armor-defeating round is not available for commercial sale, but even in straight full-metal-jacket configuration, the small, fast bullet provides a lot of penetration. As for stopping power and terminal performance when compared to 9mmâ€¦well, that's a completely separate discussionâ€”and "stopping power" and "armor penetration" weren't on Fred Craig's list of reasons for developing the TCM round. How do the 5.7mm's numbers compare to the .22 TCM? While the velocities of FN's 5.7mm at first seem better, most published velocities for that cartridge are out of the P90's longer barrel. Craig specifically designed the TCM around a truncated bullet to allow for more space inside the cartridge for powder, and it was designed to be fired in a pistol. When the 5.7mm is fired out of the FN Five-Seven handgun, its 40-grain load provides about 1,850 fps. This is at least 100 fps slower than the .22 TCM. So what's so great about the .22 TCM? Well, it's different. If something different is what it takes to get yourself and some friends or family out to the range, as far as I'm concerned that's a good thing. Second, I don't know how effective a .223-inch 40-grain jacketed hollowpoint bullet traveling at more than 2,000 fps is against human targets, but I know I wouldn't want to get shot with one. Effectiveness against two-legged predators aside, I think the .22 TCM would be a good small game cartridge. An accurate high-velocity .22 pistol with adjustable sights and a good trigger seems the perfect medicine for squirrels, rabbits, groundhogs and similar critters. Last, a lot of the cost of ammunition has to deal with weight. Heavier bullets cost more because they have more metal in them. And if you're a reloader, not only do you already know that, you know how much component prices have shot up in the past decade. Ammo for the .22 TCM is not expensive, even though it is a new and relatively uncommon caliber and made only by Armscor at its Stevensville, Montana, factory. Armscor USA sells two different .22 TCM loads on its website: a 40-grain exposed-lead jacketed hollowpoint ($21 for a box of 50) and a fully jacketed 39-grain 9R jacketed hollowpoint for $22 per 50. It's worth noting those prices have come down about 15 percent over the last five years as production has increased and the cartridge is becoming more well known. As I mentioned, reloading dies and data are already available, if you want to go that route, and 35- and 40-grain .223 bullets are widely available. While some enterprising soul will probably experiment with heavier projectiles, they can lead to excessive overall length or insufficient powder capacity with such a small case. I was able to secure only one type of .22 TCM ammo for testing: the 40-grain jacketed hollowpoint, which looks more like a jacketed softpoint in profile. Two things you will notice when shooting the .22 TCM out of a handgun. The first is muzzle flash, and the second is noise. Compared to the average 9mm, which travels at roughly half the speed, the .22 TCM is loud. Felt recoil of the .22 TCM is negligible. It definitely has less recoil impulse than a 9mm, even though the bang and flash make a bigger impression. It is a flat-shooting cartridge out to 100 yards, although you most likely will see a zero shift when switching between the .22 TCM and 9mm barrels. That is why the pistol is supplied with a fully adjustable rear sight. I've spent a lot of time talking about the .22 TCM, but not much about the fact that this is also a 9mm 1911. As I mentioned at the beginning, 9mm 1911s are popular these days. Not only are they cheaper to shoot, they have substantially less recoil than a .45 ACP and magazine capacity is higher. This is why we're seeing more 9mm 1911s in competitions. The TCM Rock Ultra FS Combo is a fun gun to shoot no matter which caliber you choose to use, and it gives you something you can't find anywhere elseâ€”at a reasonable price.